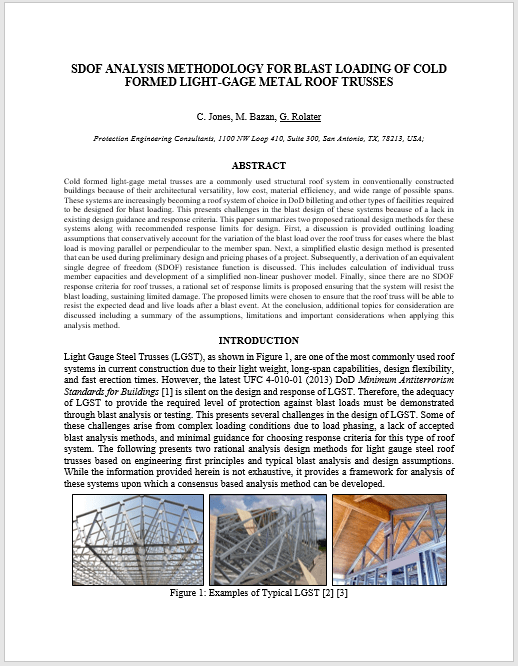 Cold formed light-gage metal trusses are a commonly used structural roof system in conventionally constructed buildings because of their architectural versatility, low cost, material efficiency, and wide range of possible spans. These systems are increasingly becoming a roof system of choice in DoD billeting and other types of facilities required to be designed for blast loading. This presents challenges in the blast design of these systems because of a lack in existing design guidance and response criteria. This paper summarizes two proposed rational design methods for these systems along with recommended response limits for design. First, a discussion is provided outlining loading assumptions that conservatively account for the variation of the blast load over the roof truss for cases where the blast load is moving parallel or perpendicular to the member span. Next, a simplified elastic design method is presented that can be used during preliminary design and pricing phases of a project. Subsequently, a derivation of an equivalent single degree of freedom (SDOF) resistance function is discussed. This includes calculation of individual truss member capacities and development of a simplified non-linear pushover model. Finally, since there are no SDOF response criteria for roof trusses, a rational set of response limits is proposed ensuring that the system will resist the blast loading, sustaining limited damage. The proposed limits were chosen to ensure that the roof truss will be able to resist the expected dead and live loads after a blast event. At the conclusion, additional topics for consideration are discussed including a summary of the assumptions, limitations and important considerations when applying this analysis method. This paper was presented at the 2016 Military Aspects of Blast and Shock Conference in Halifax, Canada. For more information about this publication or to request a free copy, contact Dr. Marlon Bazan via email at mbazan@protection-consultants.com.